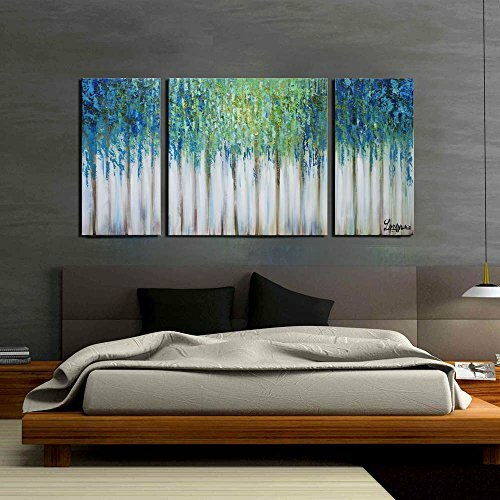 This painting which theme is forest brings the viewers into a very beautiful and poetic realm: in the early morning, through the morning mist,golden sun shines intothe forest, fresh and moist air soaks into the jungle, towering trees have luxuriant foliage and seem vibrant, all of these show the infinite vitality of nature.In this natural environment, as if you can enjoy breathing the fresh air, you can almost call out happilyin this jungle and listen to your own agitation that echo in the forest. Although the entire screenis full offorest, the interspersed arrangement and clear prioritiesmake the picture appears substantial but not disorderly, it gives an open feeling and enhances the viewer simmersive experience. In the artistic performance, the distinctive painting used a special technique to shape the leaves in order to enhance the sense of layers.Meanwhile the screen color is bright, fresh, subtle and rich, which is full of vitality, it contains the author's deep pure love to the nature yearning for a better living environment.